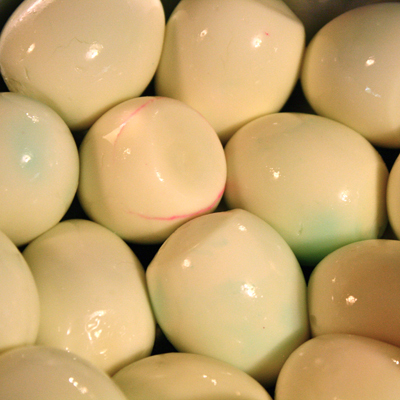 Once a year, in refrigerators all over America, loads of colorful hard boiled eggs sit neglected behind the cheese and fruit. It’s not that people don’t want to eat them, it’s just overwhelming to have so many hard boiled eggs at one time! Who has that many? Deviled egg addicts, maybe? If you look closely at the pink egg on the right you can see my daughter’s name. She was so proud to dye her egg in her favorite color. But then you notice all those other pretty eggs, ready to be eaten or made into something. And I don’t particularly like either deviled eggs or egg salad. Sigh. Luckily my mother and sister like egg salad, so I could at least make it for them. But being me, I had to dress it up a little. I have a little tarragon plant in my front porch herb garden, so I snipped off some sprigs to add some flavor to the salad. 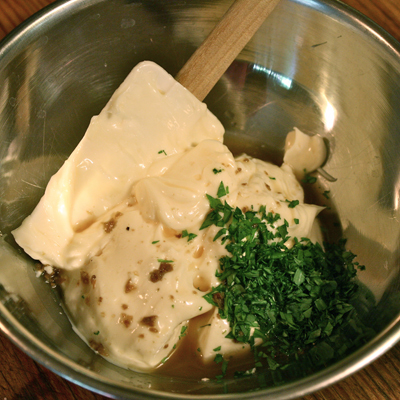 I also added a bit of vinegar to cut some of the richness of the mayonnaise. I used Fire Roasted Chili Honey Vinegar, which is now my favorite go to flavor enhancer. But you can use any vinegar you like, such as a tarragon infused vinegar or even a seasoned rice wine vinegar. Chop your eggs to the consistency you like. I do a rough chop, so the salad has texture to it. If you are not a fan of the licorice flavor of tarragon, try another fresh herb, such as basil. I had 16 eggs, but if you have less, cut the dressing amounts in half. What do you do when you have too many hard boiled eggs? Make a fresh tarragon infused egg salad, of course! Peel and roughly chop the eggs. Place into a medium bowl.In a small bowl, mix together the mayonnaise, tarragon, vinegar and salt.Pour the tarragon mayonnaise over the chopped eggs and mix very well.Serve on your favorite bread, or on a bed of fresh mixed greens. That IS a pretzel bun. I thought it would go nicely with the egg salad. And it did. Is that a pretzel bun I see there? That’s my favorite! Especially on a burger….mmmmm! 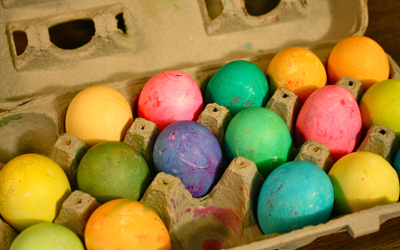 What a great way to recycle those easter eggs. I love taragon it goes so well with so many dishes. 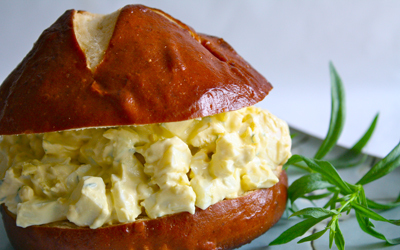 It is good, and that comes from someone who doesn’t really like egg salad! Ooo this looks so delicious! I love this recipe 🙂 The picture makes me hungry already! !